Ok so that was a lot of stuff in the theory section. I hope it wasn’t too boring though. 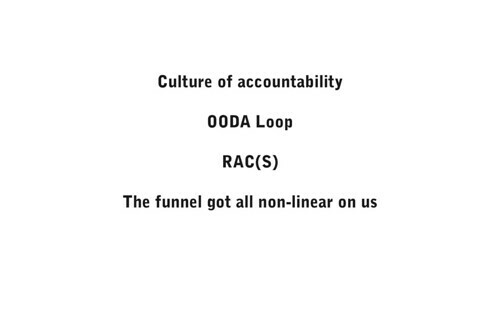 We covered building a culture of accountability based on three ways to measure, we talked about my favorite thing: The OODA loop. Then there’s the whole Reach Acquisition Conversion Satisfaction thing. And how that funnel got all non-linear on us–and why that’s good. Probably good to re-iterate the goal of the presentation at this point as well: Help you develop a clear approach for aligning your social media plan with your business goals.